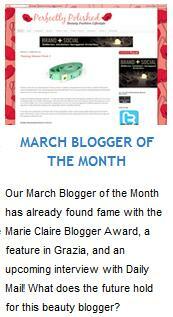 I'm Ebuzzing March Blogger of the Month! I was recently interviewed by Ebuzzing and have been selected as their March Blogger of the Month in their spotlight blogger section! If you would like to have a read of the article you can find it here.
" There's no denying that blogging and the fashion industry seem to go hand-in-hand. In fact, the fashion, style, and beauty worlds as a whole change at breakneck speeds all the time. Blogging, as a result, is the perfect match: it's something you can use to share opinions, providing up-to-the-minute commentary on the ever-changing landscape and business of fashion and beauty. The charm of being a fashion or beauty blogger has never been greater than now, likewise, one has never been able to feel as close to either industry as they can today. And without further ado, we introduce our Blogger of the Month for March, Catherine Maughan, who writes for and runs Perfectly Polished, a sizeable fashion and beauty blog. Starting her first blog in 2005 for a university project, Catherine decided to set up Perfectly Polished in 2009, after reading a lot of beauty and fashion blogs; "I decided to set my own up as a creative output to share beauty tips, favourite products, and it has grown from there," she told us. "I enjoy being part of an online blogging community." And what a community this one is. Fashion and beauty blogs number somewhere in the thousands in the UK alone, so being social via a blog of this type is really no problem - either through being a fellow blogger, or an avid reader. "I have made some really good friends through setting up my blog," said Catherine. "I enjoy the social side very much - being invited to events and meeting new people." And here, the brains behind Perfectly Polished has hit on something quite important.Yes, blogging holds many perks - especially if you're a beauty or a fashion blogger. Catherine confirms this: "When I first set up my blog," she explained, "I didn't expect that so many amazing opportunities would come from it." She went on to say that it's exciting getting a sneak-peak of products before they hit the shops, as well as being chosen before others to review products. "It's great that some companies are keen to get bloggers input and opinions at the design stage and are interested in hearing what they like (and don't like)," she said. But the important part is, we think, that you shouldn't just start blogging to become a celebrity of the blogging world, or simply to make money. It's clear that Perfectly Polished began (and continues) out of a love for sharing opinions, and it's this that's got its creator this far - not a mere want for lots of free products. "I am honest with product reviews and being Northern, I tend to be quite outspoken and say it like it is at times, which I think people find refreshing," Catherine told us. But her success hasn't just stopped at product reviews. Last weekend, she had a photoshoot with Grazia (she's being featured this week, so watch out for it). What else? She was shortlisted for the Marie Claire Magazine's 'Blogger of the Year' and 'Tweeter of the Year' awards; she is currently a contributor for www.shesaidbeauty.com; she's been to so many blogger events that "it's difficult to mention all of them", and she also - as you may or may not know - has been listed as the most influential Beauty blogger in the country by our very own Ebuzzing Labs for the second month in a row. And this is from building an audience and becoming influential - all from writing good content that resonates with the kind of people you're talking to via your blog. "I think beauty and fashion bloggers are highly influential to their followers, which benefits brands" she said, telling us a little bit about how she thinks fashion and beauty benefit from blogging. "I know that a few times I have blogged about a certain item and linked to the brand's website and overnight there has been so much demand that it has sold out," she continued. "It's pretty amazing to know I have that amount of influence." With this amount of sway in her online community, Catherine and Perfectly Polished must have been approached by hundreds of different brands, yet she herself believes that the industry has been "fairly late in engaging with bloggers and social media". Better late than never, though, right? As for Catherine's own tastes, she enjoys reading travel, food, fashion and beauty blogs. Recently she's started reading mummy blogs, but warned me: "before you ask, no I'm not expecting!" If she were, we could probably - along with the baby - expect the birth of one of the greatest mummy blogs the UK has ever seen, if Perfectly Polished is anything to go by! So, if you want to have a look at how Catherine words her widely-read content, or if you are a beauty and fashion addict, have a look at Perfectly Polished, add it to your bookmarks, and join her in celebrating all things good, and bad, in these industries. " Save an extra 10% in Debenhams Half Price Sale! Save 42% on Clarins Beauty Flash Balm! Happy Birthday Selfridges.com 2 today! Vitality Show 2012 Ticket Giveaway! Goody Double Wear Jewellery & Hair Accessories! Mystery Harrods GLOSSYBOX is revealed! Mother's Day Beauty Bargains from Cheapsmells!